Join Aaron Huey and Dr. Elaine Fogel Schneider as they talk about ADHD, Autism, Learning Disabilities and how do you discover if your child is dealing with these at school. Once you do, what next? 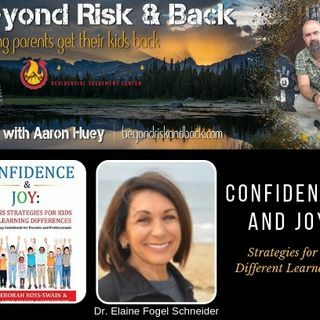 Dr. Elaine Fogel Schneider, co-author of Confidence and Joy, takes parents through the step by step process of discovery, advocacy, planning and self-care when you find your child has difficulty keeping up in the classroom. Dr. Elaine Fogel Schneider is CEO of TouchTime International and author of the best-selling 7 Strategies for Raising Calm, Inspired, & Successful Children. Drs. Swain and Schneider’s new book, Confidence & Joy: Success Strategies for Kids with Learning Differences (Crescendo Publishing, Nov. 1, 2018), provides parents and educators with tools to help children with learning differences realize lifelong success.